As heavy and darkly textured a film as any one of his masterpieces, director and star Ed Harris takes us into the tortured, inebriated world of abstract painter Jackson Pollock (1912-1956)and leaves us assured that Pollock is a certifiable candidate for the Hall of Fame "self-destructive genius" award, joining the illustrious, besotted ranks of Ernest Hemingway, Hank Williams, John Barrymore, Helen Morgan, et al. True, when has Hollywood ever bothered to put on cinematic display a gifted artist who wasn't a poster child for Betty Ford? We usually reserve well-adjusted geniuses for quieter, more tasteful retrospectives on cable TV. Harris spares no time in letting us know that Pollock is a crude, mindless, gifted mess veering toward unmitigated disaster, taking everything and everyone down with him as he does. Amazingly, in his brutally brief 44 years, Pollock manages to find, with a man-child brilliance, his life's destiny as a master of artistic expression and interpretation and the accidental inventor of the drip-action technique. Harris painstakingly chronicles the little known details of this wretched genius who somehow learned how to free up his own artistic mind while confine the rest of his world to an absolute hell. The actor/director wisely manages to avoid most of the pitfalls characteristic of these grand bios of agony and angst. In a stark, no-holds-barred performance, he lays the character out like it is -- unredeeming, hopeless, desperate, supremely gifted, yet intriguing. Its a daunting, fully etched performance that, in lesser hands, could have been one long cliche. He doesn't toy with the audience by thinking had the right circumstances come along for Pollock (and they DID come along with wife and caretaker, Lee Krasner) he could have somehow prevailed. Harris is quite believable, losing himself in the painter while showing off his researched skills with a brush. It's a true labor of love and it shows. Marcia Gay Harden's self-sacrificing Krasner breathes life not only into Pollock but the film itself. Harden, in a rich, flashy portrayal, is mesmerizing as one artist compelled to save another, giving interesting dimension to a woman whose reasons are not totally pure and selfless. 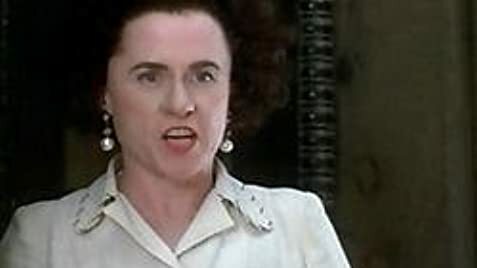 Amy Madigan (Harris' wife in real life) makes the most of her few scenes as the eccentric museum maven Peggy Guggenheim, while Val Kilmer appears in an odd, thankless cameo. Harris and Harden were both deservedly Oscar-nominated for their work here. Yet, problems do creep into the film. While Harris pours his heart and soul into this show (a ten-year pet project, so they say), Pollock's "before life" is never set up to demonstrate why Pollock became such an inveterate drunk and monster. As such, little sympathy can be mustered, holding viewers at bay. 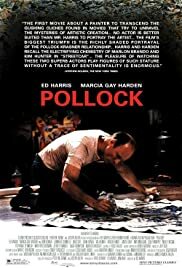 Moreover, a couple of manipulative scenes also seem to be thrown in merely to punctuate the already well-worn theme of Pollock's misery and desolation. Less is more in this case. For the most parts, however, this little film succeeds. Until now, little attention has been paid to the artist Jackson Pollock. Harris rectifies this injustice, as reprehensible as some of it is, with unsparing honesty, dedication and precision.